1. and 2. Hydrangeas (it is impossible to capture their true colours). 3. Our eleventh-century parish church. 4. Zephyr in La Guirlande de Julie by Nicolas Robert. How can I thank you for your kindness and generosity regarding my newly-fledged shop and hares (sorry, Amanda, I know you would prefer to call them rabbits or 'liebres')? I have been so touched by your enthusiasm and encouragement that I have spent a good part of this past summer week stitching, stitching, stitching - I have a few special orders to honour too - but try as I might I cannot sew quickly enough to put all my ideas into shape. I am so very happy though as these little friends are providing the perfect balance between inspiration and meditation. They cannot be hurried and my children are learning the art of taking one's time to create something. In the meantime summer continues to spread its glory and we continue to savour every moment she flings at us. Tomorrow will find us sitting by our friends' swimming pool and eating delicious local produce from our favourite village shop. In a few days we will pack our bags and head west to southern Brittany; my husband's part of the world. Before we leave I would like to share with you my recently stitched hares (which are available for purchase). Of course I am a little nervous still but I will endeavour to stride forth with a confident smile so you won't suspect a thing ;-) I will use the beautifully penned words of Katherine Swift's The Morville Year to set the scene, starting with the paragraph at the bottom of the page below: "There are two very elegant ladies in my garden". Mademoiselle Versailles is a sweet soul who enjoys afternoon tea served in the garden with a silver fork and flowery plates. She is made from the finest ivory linen. Her right ear and ankle are embroidered with fanciful French patisseries - named religeuses - in blues and pinks. On her left ankle is an ornate cake stand. Her dress is made of fine French vintage cotton (circa. 1930s) with delicate pink flowers on an ivory background. Her pantaloons are cut out of a vintage French sheet and trimmed with early twentieth-century ivory lace and cream contemporary lace on her collar. Her ears are lined with soft blue dotted cotton. I named her Mademoiselle Bluebird because of the joyful bird in flight on her ear. She was stitched in the height of summer surrounded by the vibrant shades of our violet star Clematis, the hardy lavender bushes crowned with bumble bees, and the glorious mauves and blues of our neighbour's hydrangea - see the petals at Mademoiselle's feet? - which I tried to capture in her clothes together with the softest of pale pink Ronsard roses. She is the second hare to have been inspired by Madelief's beautiful garden. Her dress is made of fine French lavender cotton and is trimmed with ivory early twentieth-century French lace, cream broderie anglaise and a fushia pink satin ribbon. Her pantaloons are cut out of Liberty cotton with delicate flowers. And breathe... And go and cook dinner. I will return in a few days, hopefully, between trips to Brittany for a short visit for I have other matters to share with you. I would also like to add how much fun I am having visiting you now that I have a little more time. Such inspiration to be found out there. All gone to wonderful homes. Farewell dear Mademoiselles! Summer is idyllic at present. Most mornings I find it soothing to stroll through the vineyards or around our garden choosing this plant or that flower to grace our collection of handmade milk jugs. To still the moment, I repeat what I suppose is a mantra as I regard the garden or countryside around me. "Beautiful, beautiful, beautiful," I repeat under my breath. I smile and breathe deeply as I say it. I am in awe of the sense-tingling beauty surrounding me. I am grateful. Yesterday evening Gaspard, our puppy, took us out for a walk. It is an enticing moment to watch the sun dip after a hot day. It is a moment to be shared. Héloïse made sweet pancakes which we carried in a basket along with a simple bottle of water. The tall grasses along the path leading to the vineyards, fluttering like graceful dancers, are growing heavy and tall. After weeks of rain the vines grow lush. We marvelled at the chlorophyll brillance and the acid-green nascent grapes. I prised one off and bit into it. My face winced at the intense sourness. It was wonderful. These are happy times. Tristan and Héloïse are back full of precious memories from their stay with my parents in Tunbridge Wells. We are together again. I have so much to share with you but I will gently force myself to keep things simple and short today. To be honest I am feeling a little shy and nervous as I introduce you to two summer hares I have just finished stitching and am putting up for sale as limited editions. To still my fluttering heart Héloïse drew the picture I displayed at the top of this post. I love the fact that at sixteen she can still produce childlike illustrations such as those sweet rabbits frolicking in a garden. She is enjoying the sunset perched amongst the leafy vines. When I made her my thoughts turned to blissful summer afternoons spent in the garden watching the shadows lengthen whilst sipping tea - or something stronger, perhaps! Mademoiselle Tea In The Rose Garden is the first of a series of hares I am creating in honour of Madelief's garden in Holland. The second will be revealed here this coming weekend and will also be available to buy. Madelief has sweetly written to tell me she would like to purchase one. Incidentally, she will be spending her summer holidays in the Cotswolds so, if you have any suggestion of delightful places to visit, please visit her and leave her a comment. 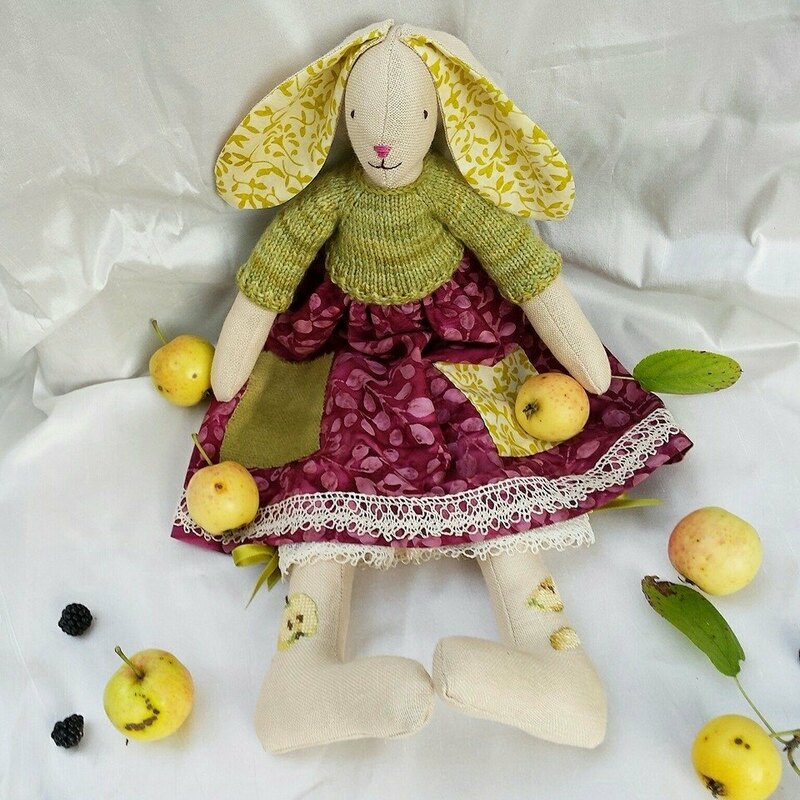 This sweet hare has been inspired by one of Madelief's garden tea parties which you can enjoy here and her Late June Garden where roses reign supreme. On her right ankle grows a beautiful pink rose and on her left ear there is a lilac coloured teacup. If you would like to make this Mademoiselle blissfully happy spend a little time out in the garden sharing your love of roses. Perhaps you could give her a doll-sized cup of tea to sip too? Mademoiselle Bloom (Where You Are Planted) is my second hare for today. Mademoiselle Bloom would be at her happiest living with garden and nature lovers who would, perhaps, take her out for the occasional walk and read books about gardening to her in the evenings. Her right ankle and one of her ears display the green vine leaves and flowers which represent our tranquil Vouvray region renowned for its sparkling white wine. Like her friend featured above her pantaloons are trimmed with early twentieth-century ivory coloured lace. If you feel compelled to purchase one of these ladies or even just to take a peek at the other limited edition hares which are available for the time being, please click here. I will be adding small groups of hares to the shop regulary inspired by the passing seasons. I am most grateful to you all for taking the time to visit today. My nerves are feeling a little less jittery now! You all make me happy and I find your input so enriching. I am leaving you for now with the exquisite work of Sue Fenlon which I had the joy of seeing for the first time over at the compelling blog Sew Sweet Violet. Sue Fenlon's work is pure heaven for me. I should warn you that her website is like the call of the sirens and you are unlikely to leave it empty-handed! I will be visiting you all this week. Ahh, wonderful summer holidays! Edit: Oh my goodness gracious me. I have just sold my first second, third, fourth hare on Etsy! I promise to make some more! Tuesday morning edit: they have all gone. I cannot believe it! When writing my last post over three weeks ago it slipped my mind that Millefeuilles had been around for a year. A few weeks ago Annie over at Knitsofacto asked us to choose one word which captured the essence of blogging. Her's was conversation. Others chose camaraderie, community, and beauty. Mine, on reflection, would be inspiration. In the same post Valerie, the illustrator and designer from Acornmoon, wrote: 'I think blogging is like having a pen pal without the stamp'. True! I could add, however, that my comments page comes adorned with a patchwork of brightly hued and intricate stamps; each one represents every single blog which has inspired me over the past twelve months. The inspiration you all generously share is as potent as my morning coffee and I am hugely grateful to so many of you for kickstarting my creativity most days. I should add that whilst I stitch away busily my Millefeuilles Hares are patiently waiting to take centre stage. They are getting a little crotchety about being behind the scenes for so long. I have assured them that their moment of glory will come soon - hopefully in my next post - when I intend to put some up for sale. I cannot help but write that one Hare, for example, has been inspired by Madelief's beautiful garden. A few have secretly been sent off with a kiss, wrapped in silk paper and velvet ribbon, halfway across the globe. Each will have a story to tell and I have promised to share their tales when the right time comes. In the meantime please consider this present post to be a stage curtain of sorts made up of the rich fabric of blog inspiration and generosity you all provide. First on the list, Jennifer Casa's delightul pattern, Neighborly. It is simple and can be downloaded for free. Perhaps, the designer writes, this little knit could inspire us to be neighbourly too: either by digging into our yarn stash and making something pretty for a local charity or donating a small amount to a good cause. It's a lovely idea. Here's mine: Linden Flower And Rose. Perched up high on our local church wall - I hope that is not disrespectul? - under the heady, sweet scent of the linden trees in bloom. I love the iridescence of this vintage nacre button, the Rooster Almerino Aran in Strawberry Cream and Gooseberry, and this simple pattern. I'm still having fun deciding how I can be neighborly! Incidentally have you had a chance to read the recently penned thought-provoking article written by Kate Davies? It is the story of her owl sweater which launched her career out of academia and into the world of knitwear design. If you haven't seen it yet you can find it here. I'd be curious to read your reactions. Next up, a truly inspiration gift from Penelope at L Is For Love. When I wrote to Penelope letting her know that her colourful parcel had safely arrived I told her that I intended to leave the package unopened for a few days just to let the anticipation linger. I opened it on the first day of Tristan and Héloïse's summer holidays with my three hippety hoppity children around me. It felt like digging deep into a big Christmas stocking and we all took turns to unearth each little treasure. Every gift was wrapped in exquisite paper and comes with a story and a little creative magic. Just look at that Manos Silk Blend yarn with its rich, plummy tones. What a treat! Around the same time Julie from Little Cotton Rabbits posted her Midsummer's Day Mittens. They were so exquisite that I promptly wound a big, fat ball of the Manos Silk Blend and turned it into the very same pattern. Mine are called Rainy Summer Mittens and whilst my technique falls short of Julie's beautiful work, I have enjoyed knitting every stitch of the Churchmouse Yarns And Teas mittens pattern with my gifted yarn. Thank you so much Penelope for your gift and your inspiring blog. Finally for now, I am showing you a plate of buttons embroidered during the last Saturday of May at the delectable Loop where I attended a course organised by one of my greatest sources of inspiration; Cécile Franconie. For those who are not familiar with this textile artist I urge you to go visit her little corner of paradise. She is an exceptional person. After the birth of her fourth child she decided to step away from her nursing job and try her luck at making a career using her hands. Twelve years later she is writing up her fifth book and her husband has been forced to eat his hat; he was a little dubious of her decision! Her eye for colour is astounding as is her feverish desire to produce and create. Cécile is about this, this and that. She is renowned for her embroidery, often inspired by garden-related themes, and her latest book is a dream. Don't let the fact it is written in French put you off. It is selling like hot cakes in Loop, London. Take a peek at this and this. I could go on and on but I will finish up here by giving you the name of her other site where she shares video tutorials of some of her designs. Click here. Before I sign off please go vist Olallieberry to get a glimpse of THE most adorable handmade birthday candles. ps For those kind souls who emailed me about our test in patience we have been informed that the judge's verdict will fall on September 6th; two months later than anticipated. We are determined to enjoy our summer nevertheless!